East Coast Throwdown is proud to announce that we are the final Premier event for the inaugural Injustice 2 Pro Series. The Injustice 2 Pro Series is a series of ranking and premier fighting game events starting May 26th with Combo Breaker and ending with East Coast Throwdown. Injustice 2 is the much anticipated sequel from Netherrealm studios to the award winning Injustice series. This iteration of the game allows players to suit up as their favorite DC hero or villain in order to determine who reigns supreme in the DC universe! New characters such as Darkseid, Swamp Thing, Deadshot and Scarecrow means that established veterans and new players alike have some new hurdles to overcome, and new matchups to learn in order to make it out of pools alive! The top 16 players in the world will be selected to participate in the Injustice 2 Pro Series finals which date will be announced later. 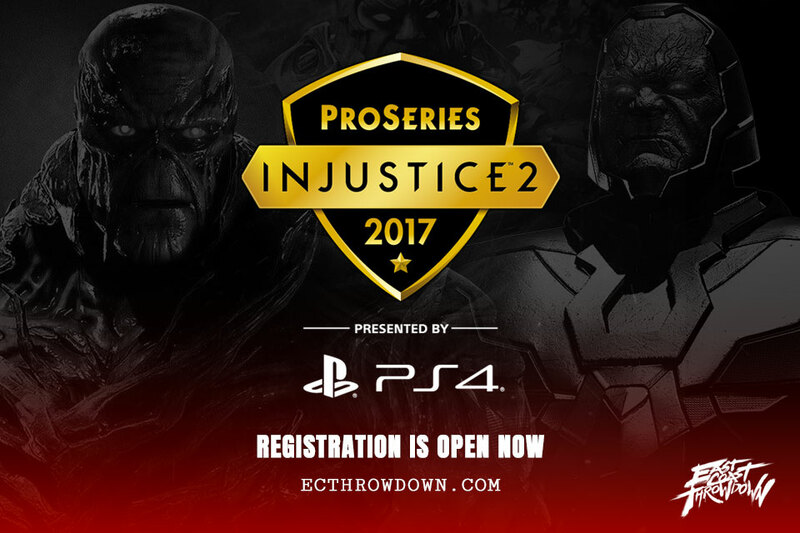 Being a Premier Injustice 2 Pro Series event means that Injustice 2 at ECT 2017 now has a pot bonus of $20,000! The pot bonus will be given in conjunction with the standard tournament prize! Here is the breakdown of the bonus and how it will be distributed amongst the top 8 of East Coast Throwdown. That’s a lot of money! So make sure you pre register(insert link) and start practicing today! The Injustice 2 tournament rules allow for the best possible outcome in a match. By running 3 out of 5 means that in a series of 5 games of Injustice 2 the first of the two players to reach 3 wins will determine the winner and advance in the bracket. But don’t worry as you have to lose twice to be eliminated from the event, so you have still a shot at 1st place if you lose once! Stage select will be set to random to avoid any player choosing a stage that can be used to their characters advantage. The team at East Coast Throwdown couldn’t be happier to be a part of this year’s Injustice 2 Pro Tour. We have a long history of epic moments in so many NRS games happening at our event and we’re sure that there will be some more unforgettable moments this year. ECT will be your last chance to win points if you are trying to make top 16 to qualify for the Injustice Pro Series finals, so make sure to pre register so you don’t miss out on the action! Register for East Coast Throwdown Today! Be sure to follow us on Twitter & Facebook so you stay up to date with the latest news.